If you’ve been following this blog for a while, you know about my theory. Not just my “daily cow” theory, but also the one on cows and pigs being best friends, as they tend to show up in a lot of places together. Today I found out they may have been more than friends the whole time (naughty…). It makes sense if you think about it. Pig meets cow, cow falls in love with pig, pig and cow have… a baby? Let me step back a minute as this reminds me of a previous post on the Leapfrog Fridge Farm Magnetic Animal Set, where I showed you how to make a cow pig. But in this case, you can clearly see this is a half-cow, half pig animal. 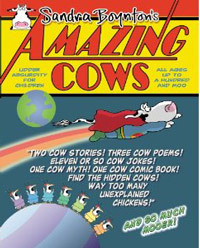 Did you notice the cow has a snout rather than a muzzle? And it has quite a round body shape too. Isn’t this my best cow spotting of the year? Who said there’s no such thing as Christmas miracles? This was a great find! Not to mention that it’s glittered up like mad. Part pixie too, I believe. Ah, I stand corrected. This is a pixie chicken pig cow. And if it was made in China, it’s a pixie lead chicken pig cow. Wow! Thank you! The opportunity was just too good to pass. A zebra hippo? Now I want to see that! I bet the vertical stripes make that hippo look thinner. 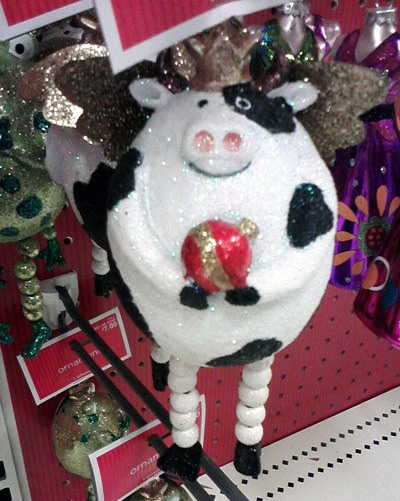 I hope you bought one to hang on your tree :) I imagine your tree to be covered in cow ornaments (with the odd pig and chicken ;) but that may be just wishful thinking on my part… I’d love to see such a cow tree! Haha, I didn’t! My husband told me it will probably be available on clearance after Christmas, so we’ll see. 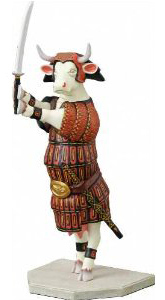 It would keep good company to my skating cow. 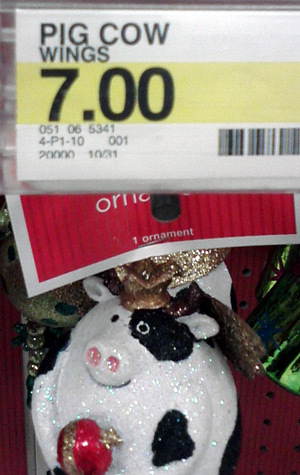 The only thing is, it’s quite heavy so I’m not sure how well it’d fare on my artificial tree. You are talking at cross purposes here: I mean, milk from a pig? Oh, this makes me think of a French children’s song that says, pull the pig’s nose and he’ll make milk, pull his tail and he’ll hatch eggs. I think this chicken pig cow is perfect for the song!